If you have a coach or other vehicle arranged, our guides will join you to conduct your tour. Join our guide in their vehicle for your tour. We also provide coaches for large groups. Book one of our guides for a walking tour of a city, castle, museum... the choice is yours! Your safety is our primary concern. Our guides are expertly trained and assessed in group management and safety skills. Our training courses are accredited by the World Federation of Tourist Guides Associations (WFTGA). Blue Badge Guides undergo a rigorous 18 month training course in the classroom and out on the road, completing in excess of 1,300 hours of study. Assessments take place at regular intervals throughout the course leading to the final STGA accreditation exam. All Blue and Green Badge Guides are covered by our Public liability and Professional Indemnity insurance. Our training courses, assessment procedures, and accreditation exams ensure that our guides are experts in delivering engaging and factually correct information. Non-native speaking guides are assessed in accordance with the Common European Framework of Reference for Languages Scale for Level C1 and C2. As a condition of membership all of our guides must adhere to the STGA’s Standards of Performance and Code of Conduct. Working in conjunction with Historic Scotland, National Trust for Scotland, and countless other venues, attractions, and businesses throughout the country. 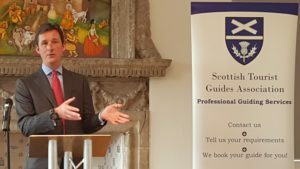 Scotland has 31 new tourist guides to help cater for the growing number of visitors coming north of the border. This week they received their blue badges from STGA president, The 13th Duke of Argyll, Torquhil Campbell, at Linlithgow Burgh Halls. The Duke revealed that visitor numbers have grown at his castle from 102,000 in 2016 to 125,000 this year said that Scotland’s tourism industry was in wonderful shape. “It really is so positive and it is so encouraging to hear the statistics about tourism in Scotland,“ he said. STGA chairman Linda Arthur pointed to the recent Lonely Planet inclusion of the Highlands and Islands in its top 10 Best in Travel destinations. “The demands of our tourism industry are growing at a rapid speed,” she said. Visitors expect high standards and the Blue Badge qualification provides reassurance to tour operators and travel agents that they are getting the best. The STGA has a strong specialism in providing guides with foreign language skills. Languages spoken by some of the new guides include French, Italian and German, Finnish, Russian, Turkish and Chinese mandarin. The new guides come from a wide range of backgrounds including a photojournalist, a science researcher and an archaeologist. Blue Badge tourist guides are qualified to take visitors on tours anywhere in Scotland. The new guides are (In alphabetical order): Karen Anderton, Paula Benassi, Elaine Black, Gill Brown, Valerie Eglinton, Katrina Faccenda, Miles Forde, Agnes Fraser, Federica Giacobbe, Sean Gordon, Robert Keightley, Emmanuelle Lennon, James Leslie, Maureen Lightbody, Christelle Liscia-Sadik, Alasdair Macdonald, Fiona Mackenzie, Maggie Macrae, Vivienne McConaghy, Kaori Mcgregor, Anne McPhail, Deborah McVittie, Heather McWalter, Mairi Naseer, Anne Reid, Dorothy Rodger, David Spooner, John White and Diana Maria Zilioli.